We use genetics, microscopy and biochemistry of Arabidopsis to understand how cell surface receptors regulate plant development and the response to pathogens. I study the vascular plant Cell Wall Associated Kinases, WAKs, that serve as pectin receptors required for both normal cell elongation and for an induced stress response. Bruce Kohorn delivers the Linnaean Professorship of Biology and Biochemistry Inaugural Lecture. 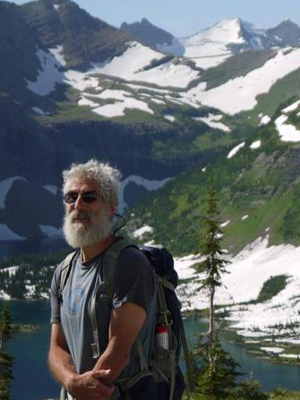 The lecture, titled "From Mountains to Membranes," will be an exploration of the mechanisms that create plant cell form and function, with a concentration on the cell surface and its interaction with the cell wall. Images taken of plant leaf cells on Confocal Microscope. 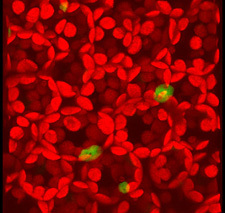 Left: Actin in green, red is chloroplasts. Right: vacuolemembrane in green with red chloroplasts. 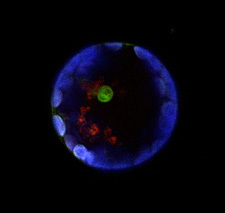 Left:View of Arabidopsis leaf; nuclei in green, chloroplasts in red. My studies now concentrate on two types of signaling pathways. One involves communication between the extracellular matrix (ECM) and the cytoplasm of angiosperms. The other project involves a redox controlled, membrane bound organelle protein kinase that regulates light energy transduction and the perception of light. The plant cell wall is secreted and assembled by cells such that it can provide structure and shape, and thereby help to determine the form of a plant organ. Control of the synthesis and directional enlargement of the wall is therefore crucial for plant development, but the wall also serves as a first defense against common plant stresses such as pathogens and physical wounding. My lab discovered the vascular plant Cell Wall Associated Kinases, WAKs, and over the last twenty years has helped to establish that they are pectin receptors required for both normal cell elongation and for an induced stress response. Cell walls differ greatly between species and cell types, but the primary wall or region that is first laid down seems to have a similar basic underlying architecture. 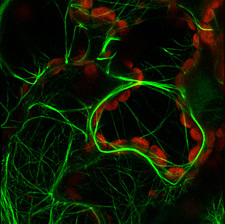 A rosette of plasma membrane cellulose synthases extrudes cellulose polymers into the extra cellular space, resulting in intertwined cellulose fibers of varying complexity. Cellulose synthase is associated with the cytoskeleton which helps in its directional synthesis. 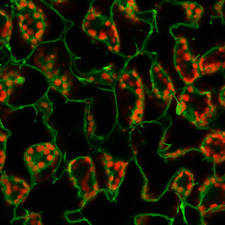 The cell wall contains a number of other sugar-based polymers, such as hemicellulose and pectin both of which are synthesized in the golgi and secreted via vesicles. Regulation of the direction and time in which the wall is synthesized and expanded can therefore dictate cell size and shape and organ characteristics, since the cell wall restricts the outward forces of cellular turgor. Pectins in plants form a jelly like matrix in which cellulose, hemicellulose and a variety of other carbohydrate and proteins are embedded and collectively are termed the plant cell wall. Pectins are chains of α-(1-4)-linked D-galacturonic acid, forming polymers of homo galacturonic acid (HG) of 100-200 residues. Pectins are present in variable lengths in the cell wall, but are fragmented during wounding or pathogen presentation, and these fragments are termed oligogalacturonides or OGs. Some have suggested OGs play a fundamental role during developmental processes, and there is abundant literature that suggests OGs stimulate a specific cytoplasmic response, including the activation MAPKs and numerous defense related genes, and an accumulation of ROS. Until recently the existence or identity of a pectin or OG specific receptor was unknown. Over the past few years, we and one other lab have established that the Arabidopsis Wall Associated Kinases or WAKs are pectin receptors. The WAKs of Arabidopsis bind to pectin in the extracellular space, traverse the plasma membrane, and have a functional serine threonine kinase domain in the cytoplasm. 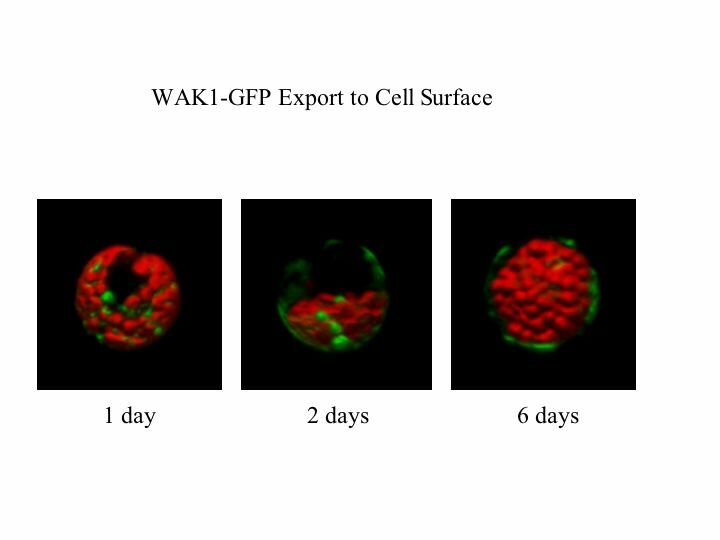 WAKs are bound to pectin in native cell walls and their activity is required for normal cell expansion, yet OGs also bind to WAKs and mediate a response to pathogens and wounding. Our current model is that the type and concentration of pectin present in the wall leads to a WAK-dependent activation of different signaling pathways. Unchallenged but expanding walls would preferentially activate, via WAKs, a cell expansion path that includes Mitogen Activated Protein Kinase 3 (MPK3). When OGs are generated by a wall disturbance, the WAKs may alter their signaling path to help effect the stress response by now also activating MPK6 and a new downstream response. That the in vitro binding assays reveal a higher binding affinity of OGs than longer polymers for WAK suggests a mechanism by which WAKs can switch from binding the native cell wall pectin to OGs, thus distinguishing types of pectin. Differential activation by various pectins might be achieved by the specific pectin affinity of an individual receptor, or perhaps combinations of WAKs with as yet unidentified partners. In the 1990s my lab discovered a family of Arabidopsis receptor-like protein kinases that we initially thought were only active in the thylakoid membrane of the chloroplast. These receptors were identified through a biochemical screen for a protein that phosphorylated the light harvesting antennae (LHC) of photosystem II, and the family was termed TAK for Thylakoid Associated Kinase. We established that indeed TAK1 and TAK2 were required for LHC phosphorylation, and this is important as phosphorylation induces the migration of the LHC between PSI and PSII so as to balance the energy input. Most fascinating it that these receptors have strong structural similarity to the developmentally important TGFb family of metazoans, including alternatively spliced messages that encode inhibitory receptor domains, and a common dimeric, co-receptor activation method. We then realized that the TAK family contained 7 members, some of which were instead localized to the mitochondrion, and to the plasma membrane. Single mutations in TAKs had little phonotypic effect, yet triple mutants appear to create female gametophyte lethality; the pollen germinate and meet the egg yet are unable to correctly fertilize. Our goal is more fully characterize this TAK family, and to establish the respective role of each member that is differentially localized in the cell. Kohorn, B.D, Kohorn, S., Saba, N. and Matinez, V.M. (2014) Requirement for Pectin Methyl esterase and Preference for Fragmented Over Native Pectins for Wall Associated Kinase Activated, EDS1/PAD4- Dependent Stress Response in Arabidopsis. J. Biol Chem 2014: 18978-86. WAKs, As Pectin Receptors. Frontiers in Plant Science 3:88, 1-4. Kohorn, BD, S. Johansen, A Shishido, T Todorova, R Martinez, E DeFeo, P Obregon (2009) Pectin Activation of MAP Kinase and Gene Expression is WAK2-dependent. Plant J 60, 974. Kohorn, B.D., Kobayashi, M, Johansen, S., Fischer, A, Byers, N,. (2006) Wall Associated Kinase 1 is Crosslinked in Endomembranes and Transport To The Cell Surface Requires Correct Cell Wall Synthesis. Journal Cell Science 119: 2282-2290. 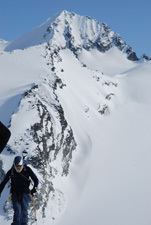 Kohorn, B.D., Kobayashi, M, Johansen, S., Riese, J., Huang, L-F., Koch K., Fu, S., Dotson, A., and Byers, N, (2006). An Arabidopsis Cell Wall Associated Kinase Required for Invertase Activity and Cell Growth. The Plant Journal 46:307-316. 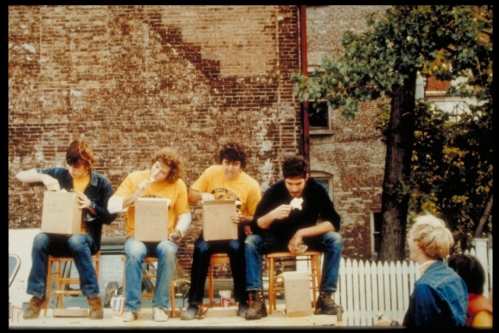 Anderson, C.M., Wagner, T.A., He, Z.H., He, D., and Kohorn, B.D. 2001. WAKs : Cell wall associated kinases linking the cytoplasm to the extracellular matrix. Plant Mol. Biol47:197-206. Kohorn, B.D. 1999. Shuffling the deck; plant signaling plays a club. Trends in Cell Biol. 9: 381-383. Bernd, K., Perret, M. and B.D. Kohorn. 1997. Protein translocation in chloroplasts; contributions from Chlamydomonas. In the Molecular Biology of Chlamydomonas. Eds. Rochaix, Goldschmidt-Clermont and Merchant. Smith, T.A., B.D. Kohorn. 1994. Mutations in a signal sequence for the thylakoid membrane identify multiple protein transport pathways and nuclear suppressors. J. Cell Biol. 126:365-374.